Pink with pops of verde are calling my name today. Perhaps its this weekend's bridesmaid duties that I'm very much looking forward to & require me to wear light pink or maybe its plotting my Labor Day in La La Land visit to the Beverly Hills Hotel. Those are just some educated guesses, but either way - these happy summer colors are on my radar. 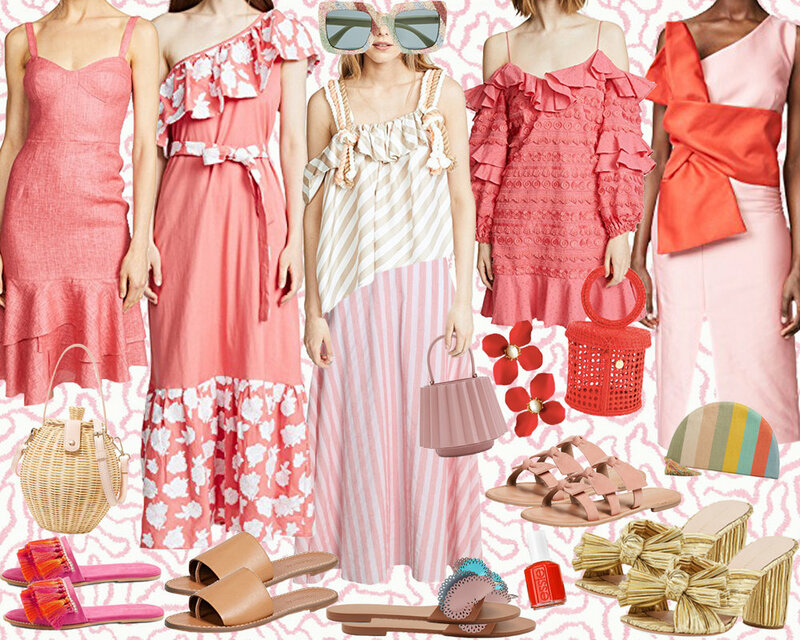 There's something about the color coral that makes me think of summer. During my habitual take-me-anywhere-but-here research, I came across The Coral Room, a cocktail bar in London's Bloomsbury Hotel designed by notable designer Martin Brudnizki - aka eye candy at its finest. I was left ruminating on the color (and how I can get back to London ASAP), which conjures up images of tropical fruits, sunkissed skin, 50's era decor and Bahamian beach houses next to turquoise water. Ranging in shades from salmon to terracotta, it instantly brings warm, happy vibes to the viewer's eye. I hope it brings some of the same to your Wednesday. And I also believe in the power of human resilience - even in the face of something so relatively trivial and insubstantial as the fact Instagram recently removed the capability to "like" a photo in order to receive an email with the shop-able products I feature. What's a gal to do? Well, besides shopping directly from this website, you can also download the LIKEtoKNOW.it app from the App Store and follow me [@upthegetup] on there, which will allow you to shop the products in each collage.